Would you pay for your favorite app more than once? App Store developers are betting that you will. When Apple unleashes iOS 7 on September 18th, hundreds of thousands of apps will be revamped for the new operating system in the days and weeks to come. 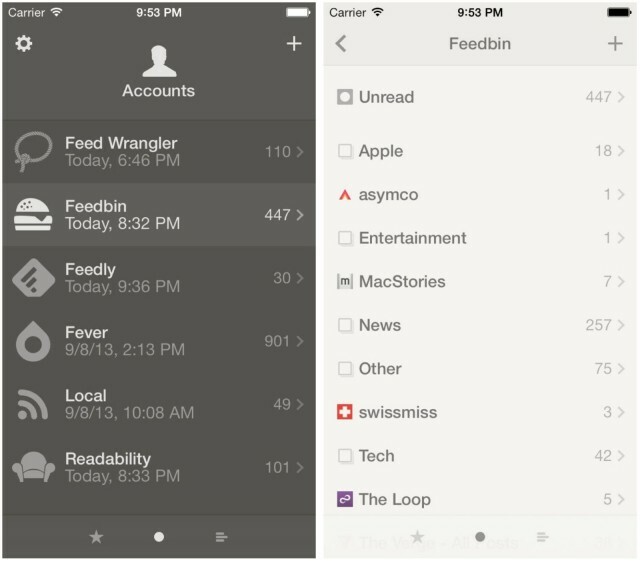 Last week, Reeder, one of the most popular RSS clients in the App Store, relaunched as Reeder 2 for iPhone and iPad. Instead of a free update to the existing app, Reeder developer Silvio Rizzi chose to release version 2.0 as an entirely new app for $4.99. If existing users wanted the new, iOS 7-ready version, they paid the same amount as someone downloading Reeder for the first time. The choice to release major updates to existing titles as separate, standalone apps in conjunction with the iOS 7 makeover is a common trend among devs who opt to stick with the traditional, what-you-pay-is-what-you-get-model of selling apps, like Rizzi, who did not respond to a request for comment. Update: Rizzi reached out following the publishing of this article with some clarifications on his decision to price Reeder 2 independently from the first version. Rizzi saw releasing Reeder 2 as a universal download for iPhone and iPad as “a good compromise between a free update and two separate updates for iPhone and iPad. That said, if I had to do this for free, I would never have put that much work into this. If I do charge, I really try to make sure it’s worth it even if it means that I have to delay the release of the app, which I actually did. The initial plan was to release this in late spring at the latest.” Making apps is a business, and it’s easy for users to not consider the kinds of decisions that go into making quality software. There’s little doubt that the majority of iOS 7 updates to existing apps will be free (which will please Apple), but I suspect there will be a surprising number of developers who will use the launch of the new operating system to completely re-boot their app, and why not? The visual and interactive paradigms iOS 7 mark a natural breaking off point and a perfect opportunity to re-coup costs. Some existing paid apps might even adopt an iOS 7 only strategy which means they’ll have no choice but to charge again. Apple has not offered a way to upgrade pricing in the App Store, so devs are forced to create separate versions of apps and pull outdated ones from the store. 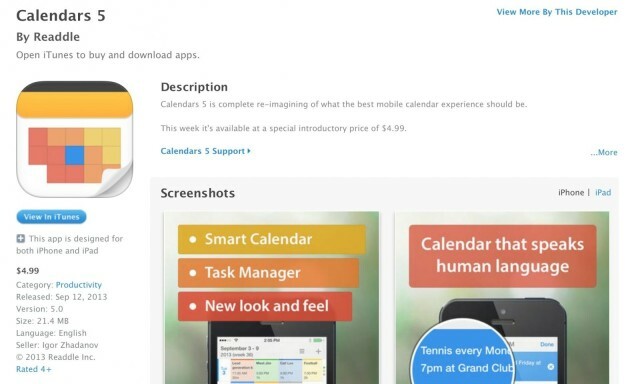 Readdle launched the iOS 7-ready app Calendars 5 last week as a separate app and the response from users was positive. More than 25 percent of previous users paid the upgrade for version 5 within 72 hours of its launch, making the app the number three top paid app in over 40 countries. Realmac Software recently announced that its award-winning to-do app, Clear, would be sold as a separate app for iOS 7. “For us, just as with many other developers, the launch of a new version of an app represents a significant amount of work and financial investment,” Realmac Product Manager Nik Fletcher explained to Cult of Mac. “Clear for iOS 7 is a new app because the majority of the work in it is a new app.” iPad support is coming for the first time with the new release and Realmac has spent the last eight months working on it. 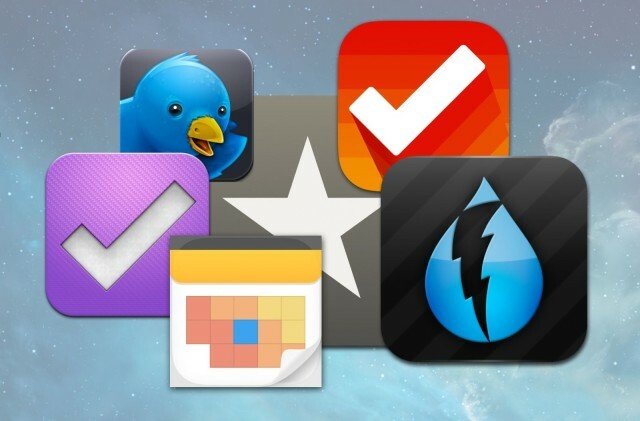 The Omni Group has announced the same strategy for the iOS 7 versions of OmniFocus, OmniOutliner and OmniPlan. “The new apps will be released as new products in the App Store; you’ll purchase them just like you would any other app and they will be completely separate from the old versions,” said Omni CEO Ken Case on the company’s blog. “Because of the relative expense of Dark Sky, we’ve effectively got zero percent of the iPhone market (give or take a thousandth of a percent),” said Grossman. “So the untapped customer-base is essentially infinite, which means we have constant revenue coming in. We don’t need to make money twice off the same people. . . yet.” Dark Sky currently costs $3.99 in the App Store. The most popular way devs make money in the App Store nowadays is by employing the ever-popular freemium model. Instead of charging up front, users are prompted (and in unfortunate cases, forced) to pay to unlock features via in-app purchases. Games like Plants vs. Zombies 2 are good examples of this approach. Most App Store customers are hardly willing to pay money for apps up front period, much less titles they already own. The freemium model has been proven to work, and the fact that the vast majority of App Store apps are free reflects the shift in strategy. Most App Store customers are hardly willing to pay money for apps up front period, much less titles they already own.